Project 1808 is working to foster an understanding of personal and public health through a variety of community programs. Through these initiatives we are working to promote health and wellness, enhance access to health care, and build health capacity system through training, research and outreach. All in hopes of fostering a healthier and more resilient community. During the recent Ebola outbreak, Project 1808 students organized themselves into community sensitization teams. Working with the support of Project 1808, the Koinadugu District Council, and the District Medical Officer. Though Koinadugu is considered to be the most isolated and underdeveloped region of the country, it was the only region that was able to fend off the virus for the first 6 months of the outbreak. We believe this was due in part to the effort our students put into educating the community about the virus. During the outbreak, Project 1808 Founder Alhaji N’jai utilized his prior experience working in radio to produce a bi-weekly broadcast to educate Sierra Leoneans about the disease and how to prevent its spread. Read more about this initiative on the University of Wisconsin-Madison’s Global Health Institute’s “GHI in Action” Blog. Ebola is no longer being closely followed by the western media, but that does not mean our work is over. The virus had a great impact on communities throughout Sierra Leone and West Africa. Survivors of the disease have become stigmatized, family members were lost, and communities lost crucial health care workers during the outbreak. Project 1808 is now dedicating a large amount of our time and resources working to help communities heal and rebuild. Currently, our program director is spending 6 months in Freetown and Koinadugu, working closely with the University of Wisconsin-Madison, the University of Sierra Leone, and the University of Tokyo to conduct research on the psychosocial impact of the outbreak and recovery process. We also continue to educate our communities about the virus and other infectious diseases affecting the region in hopes of preventing future outbreaks. While we do our best to maintain ongoing programs that promote health and wellness in the district and the country as a whole, we have also organized community events to educate the community and our students on various aspects of health. Our Sustainability and Innovation Camps have been one of our largest events organized in coordination with the University of Wisconsin-Madison Global Health Institute and their Undergraduate Field Course program. Our camp in 2014 brought over 400 students to the community center in Kabala where they participated in activities focused on nutrition, hygiene, and sexual health. Click here for more information on our Sustainability and Innovation Camps. Project 1808 firmly believes that water is a human right. In accordance with the belief, we are working to guarantee our communities have access to clean water. 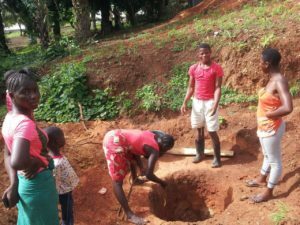 Currently, this initiative is being spearheaded by our students in Kabala as they are working to build a well for a neighboring community. We have partnered with Strides for Africa — also based in Madison, WI — to fund the completion of a well in a community neighboring Kabala where our students first identified the need for a community well. Our students, seeing a need for a well in the community began construction by hand. With the help of Strides for Africa we were able to complete the well and begin raising funds to provide more sources of clean water throughout Koinadugu District.